New from SigTac comes the SigTac-DLP (Drop Leg Platform). The Tactical DLP offers the versatility of a modular platform which can utilize existing SigTac holsters and pouches. The polymer main panel offers breathability and conformability to the users upper leg dimension. Fully adjustable straps fitted with ITW-Nexus revolutionary side release buckles make the holster comfortable and fully adjustable to the operator. 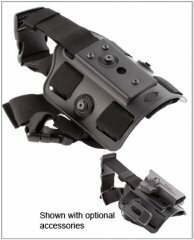 Holsters and equipment pouches can be removed and installed while being worn due to SigTac's unique mounting system. High-tech, black polymer main attachment panel. Fully adjustable straps with side release buckles. Easily attach holsters, mag pouches and more.